That was the first and the only stonework castle of the Teutonic Order, built in the present territory of Lithuania. In 1252 the crusaders built here the first wooden castle, however the next year, after the attack of Lithuanians and Sembai, the base for the stonework castle were set near the castle. It was built on the land of Curonians, which belonged to Livonian branch of Teutonic Order, but in the 1328 was given to the Prussian branch of the Order. The castle was persistently attacked by the Semogitians. During the attack in 1379 the castle was burned, later reconstructed. It was again attacked by the Semogitians in 1393. On the eve of Zalgiris battle, in 1404-1409 the castle was completely reconstructed. After the victory in Zalgiris battle, Vytautas have requested to give Klaipeda to Lithuania. His fighters took the castle over in 1414, but did not make it a lodgment. In 1422 while composing the contract of Meln it was left for the crusaders. Since that time until 1919 Klaipeda have been under authority of the Teutonic Order, Prussia dukedom, and Empire of Germany. Klaipeda was annexed by Lithuania only in 1923. The castle was reconstructed into bastion castle in XVI-XVII. Only the northern part of bastion castle has remained or was partially reconstructed, castle museum has been opened since 2002 in the sally port of the castle (branch of Lithuanian History museum). Old Trakai Castle was the oldest brick castle established by Gediminas. Firstly it was build up as a second capital of Lithuania, but later this role was passed for newly built Trakai. This castle was a birthplace of the commander of Grunwald Battle – Grand Duke Vytautas. According to the legend Gediminas built this castle even before moving the capital to Vilnius. It was a brick castle but only building structure under the ground and the castle site of spectacular size with the buildings of Benedictine monastery and Neo Gothic style church has left until present day. Gediminas passed this castle, centre of the one most strategically important region of Lithuania, to his son Kęstutis. He ruled the Duchy of Trakai in 1337-1382 as a distinguished commander and protector of Lithuania from the Teutonic Forces. Around 1350 it was here in the Old Trakai in the family of Kęstutis and Birutė the greatest ruler of Lithuania of all times Grand Duke Vytautas was born. Kęstutis left the Castle of Old Trakai in the 8th decade of 14th century when the new castle was built in 6 km to North-West, in the Peninsula of Galvė Lake. It was the Trakai Peninsula Castle. Meanwhile the Old Castle of Trakai which importance faded was given to Benedictine monks in 1405 by Vytautas. Eventually ruled by them this castle has ruined. The reconstruction of the present monastery building started in the second half of 18th century. It was closed in 1845 and the buildings were passed to a presbytery next to which in 1898-1899 the present Neo Gothic church emerged. In 2010 the monastic life in the monastery complex was resumed – the monastery of St. John Apostolic Sisters was established. It is located not far from Anykščiai, near the New Elmininkai. It is the most explored mound in the Lithuania at these days. It is the most widely explored mound in all the East Baltic, too. The results of the archeologists let us reproduce the real plan of the castle. It has been a big dream from 1997 till 2009, to built a new authentic wooden castle as the sign of respect to our historical past. The castle should become the ,,alive museum” with a real battles of the knights. As if it was the first such kind of building in Lithuania, built in the authentic area, it should engage the different people in Lithuania and abroad. Siesikai Castle is the residential castle near Siesikai, Ukmergė district, Lithuania. The castle on the Siesikai Lake was built by Gabrielius Daumantas-Siesickis in the 16th century in the Renaissance style. His heirs were known as Daumantai, also called Siesicki, had given their family name to the nearby town. The masonry palace was reconstructed in the Neoclassical style after 1820 by Dominik Dowgiałło. Only 2 towers remain from the former castle, which had four of them in every corner of the palace. The castle has been undergoing restoration since 1990. Medininkai Castle (Lithuanian: Medininkų pilis), a medieval castle in Vilnius district, Lithuania, was built in the late 13th century or the first quarter of the 14th century. 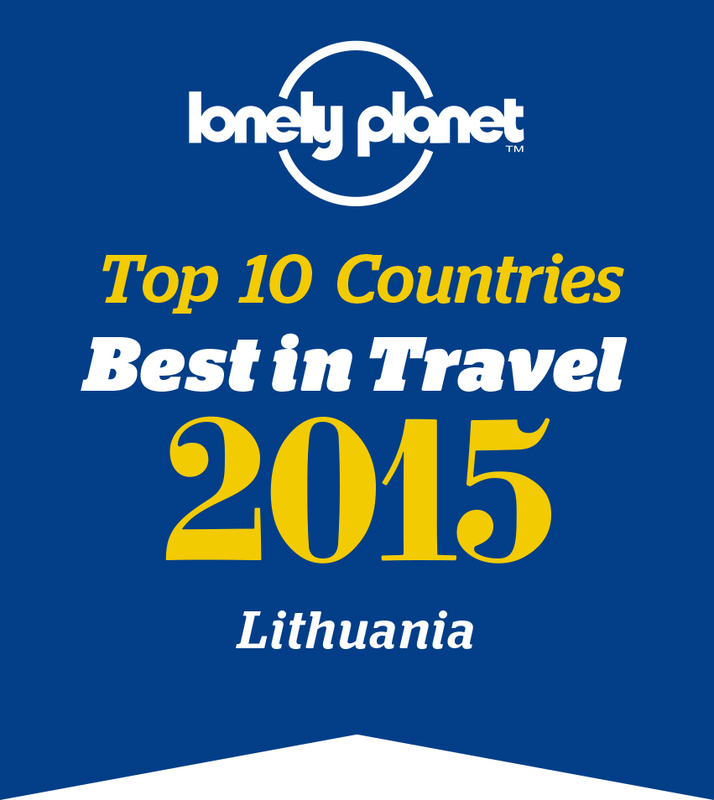 The defensive perimeter of the castle was 6.5 hectares; it is the largest enclosure type castle in Lithuania. The castle was built on plain ground and was designed for flank defense. The rectangular castle's yard covered approximately 1.8 hectares and was protected by walls 15 meters high and 2 meters thick. The castle had 4 gates and towers. The main tower (donjon), about 30 meters high, was used for residential quarters. Medininkai was first mentioned in 1392. The castle was badly damaged by a major fire in the late 15th century. Because of increased use of firearms, this type of castle was no longer suited for defensive purposes and was later used as a residence. During the 17th – 18th centuries it was reorganized into a farm and a bakery. 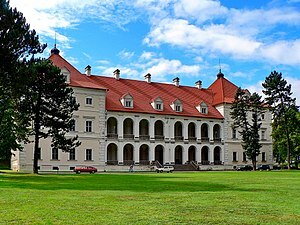 Biržai Castle is a castle in Biržai, Lithuania. Construction of the earth bastion-type castle started in 1586 by the order of Krzysztof Mikołaj "the Lightning" Radziwiłł. In 1575, preparing for this construction, a dam was built on the Agluona and Apaščia rivers at their confluence, and the artificial Lake Širvėna, covering about 40 km², was created. Major castle building works were finished in 1589. Since the second half of the 17th century, the castle has been the main seat of the Biržai-Dubingiai Radziwiłł family line, which was transferred here from the Dubingiai Castle. Biržai Castle served as a major defensive structure during the wars with Sweden. It is the only insular castle throughout Eastern Europe. It was built on one of the numerous islands in Lake Galvė. The castle was built as a defensive fortress. After the Battle of ?algiris/Gr?nwald the castle lost its defensive significance. It was turned into a ducal residence. Trakai Island Castle was the death-place of Grand Duke Vytautas. He died here on 27 October 1430. Later the castle served as a prison. In the XVII century the castle was desolated. Island castle is one of the most often visited historical-architectural monuments in Lithuania. It houses a historical museum which has been working here since 1962. National events, festivals and concerts take place here. Kaunas castle is the oldest castle in Lithuania. 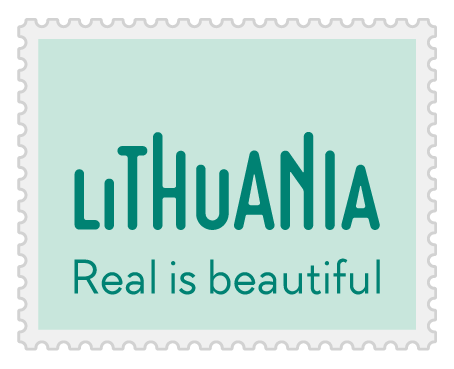 It is situated at the confluence of the two largest Lithuanian rivers - the Nemunas and the Neris where the town was founded. The castle was built in the middle of the 14th century. Until the beginning of the 15th Century, Kaunas Old Castle was an important resistance post against the attacks of the Teutonic Order. After the victory of joint Lithuanian-Polish forces in the Zalgiris (Grunwald) battle in 1410, during the reign of Vytautas the Great, the Grand Duke of Lithuania (1392-1430), the period of true prosperity started. At that time Lithuania had already acquired Christianity. Kaunas was given the Magdeburg rights and enjoyed the years of development in trade, crafts, culture, and extensive contacts with Western Europe. Built in the 13th century, the castle was Lithuania?s first defensive bastion and the only double-walled castle in all of Lithuania. The surrounding walls were initially over 2m wide and 13m high. In 1362 however, after a three-week long siege, the crusaders destroyed it. By 1368 a second, stronger castle had been constructed. The castle originally had four towers, but over the centuries the river Neris has washed them away, forcing the northern walls to collapse. The remains of the castle rebuilt by Vytautas in the beginning of the 15th century reached our times. However, only the third of the castle survived. The old castle building was built of wood. Later, under the rule of the Duke of the Grand Duchy of Lithuania Gediminas (1316-1341), was brick in with stones.The nowadays Gediminas Castle is the remnant of the brick castle built by Vytautas Magnum, the Duke of Lithuania (1392-1430). There are left more fragments of old castle, which are now restaurated according to numerous archeological researches on the Gediminas Hill.It is possible to get onto the top of the Gediminas Hill by foot or by modern lift, and visit Gediminas Castle from inside, where the exposition of archeologic findings is kept. From the top of the Castle, there is an observation ground, from where panorama of Vilnius Old Town opens for the spectators.Gediminas Castle is important state and historic symbol of Vilnius and Lithuania, it is depicted on national currency Litas, sang in folk songs and mentioned in numerous patriotic poems of many poets. Until the 16th century Raudone was a royal manor. At the end of 16th century Crispin Kirsenstein, who was a son of a Prussian immigrant, built a Renaissance style castle here. Since C. Kirsenstein's grandson became the exchequer and secretary of the Lithuanian Grand Duchy and base himself in Raudone, the castle became prosperous. Later it was rebuilt, destroyed by fire and war. Nowadays a secondary school is established in the Raudone castle. The 35 m tower is open to visitors. The castle, built 1604 - 1610, was not primarily a defensive stronghold. The first owners of Panemune Castle was Hungarian nobles. A typical 17th century feudal castle had defensive tackle, living quarters and farm buildings. The castle stands in a park on a high hill and is girdled by five cascading ponds.<br>Characteristic architectural styles: Renaissance, Baroque, Classicism.<br>Panemune castle has recently being restored.